Good news for the candidates of the Ahmedabad. The aspirants who are most searching for the IT Jobs in Ahmedabad 2018 can refer this page. In this article, we are providing the Software Jobs for the aspirants who are trying hard to get the job in the IT Sector. The unemployed candidates can check the latest Job Openings of various companies. This is the good source to find the Software Jobs For Freshers over one place. We are providing the complete information about the IT Jobs in a brief manner to make the candidates search easy. All the job seeking candidates can apply for the various Private Jobs in Ahmedabad from the links which we have given on this page. So Interested candidates can check and apply before the end date. Ahmedabad is also known as Amdavad or Karnavathi (historically). Gujarat is the former capital of Ahmedabad and was known as the “Manchester of the East” for its textile industry. Candidates who are with a young attitude and willing to build their career in the IT Sector can apply for the various IT Jobs in Ahmedabad 2018. As we all know that the Ahmedabad is the largest supplier of denim and it is one of the largest exporters of Gemstones in India. All these industries are providing a plethora of job opportunities for the candidates who are seeking for the jobs. To be in the first place of the recruitment process, contenders have to apply before the last date. Most of the candidates are not clear about the advertisements related to the IT Job Openings. So to avoid all that confusions we will provide the complete information on our website. Generally, the contenders can also check the job openings by visiting the official website. As there is high competition among the applicants for the IT Jobs in Ahmedabad 2018. The candidates will select based on the performance in the selection process. Each and every company officials will conduct the rounds as per the rules of the particular company. To overcome the competition we suggest the aspirants prepare well for the Written Test by using the Syllabus & Test Pattern, Placement Papers furnished on our website. Applicants can prepare well for the exam by using this stuff. In this page, we will provide you all the latest Software Jobs for freshers that are disclosed by the various companies. As there is an enormous number of Software Engineer and Software Developer Jobs in Ahmedabad. The aspirants can utilize this opportunity by applying before the last date. The main intention to furnish all the particular at one place is to reduce the search burden of the applicants. Along with the notification, we are providing the eligibility criteria such as education qualification, age criteria, salary details, selection process, number of vacancies and apply link. Our request to the aspirants is to apply for the IT companies in Ahmedabad by using the given link only if they are eligible. The automobile industry is a most important part of the city. While these industries provide a lot of opportunities. The aspirants who had completed their education in BE/ B.Tech (Computer Science, Other streams), B.Sc. (Science), BCA (Computer Application), B.Sc. – IT are eligible. 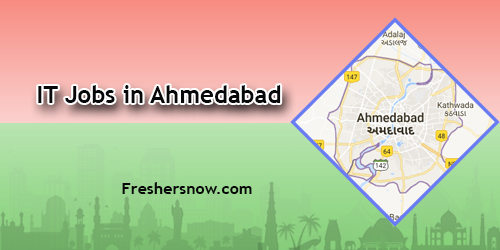 The Information Technology industry has developed extremely in Ahmedabad. These IT Industries are providing the major job opportunities for the candidates of the Ahmedabad city. We will provide a table with all the IT Jobs in Ahmedabad 2018. Nowadays a large number of aspirants are choosing the career option in the IT field. Among the top nine most competitive cities in the country, the Ahmedabad ranked the fifth position for the IT-enabled services. So candidates can check the various Software Openings for freshers from this article with less effort. To provide benefit for the candidates we will update day to day IT Jobs in Ahmedabad 2018. By looking this page the aspirants can find the latest job openings for freshers. We hope we are updating complete information on our website www.freshersnow.com. So our advice to the candidates is to bookmark this page for the regular updates. We will update as soon as the notification released.